I love Pinterest for meal planning, it's prefect for finding, organizing and storing recipes until I'm ready for them. I have a variety of boards set up, everything from things I've made, to things I want to make. Hence the name of my favorite board "my someday" this is where I put all the drool worthy items I plan to make "someday. "Of course not everything on this board will actually get made but it's still my go to resource when planning a meal. 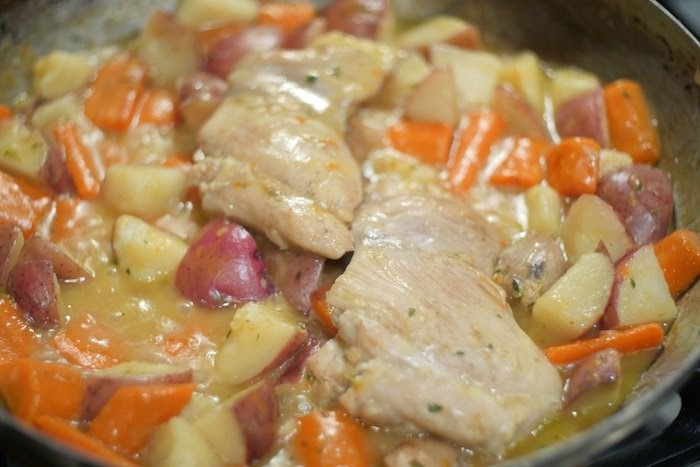 Braised Chicken Thighs with Carrots, Potatoes & Thyme from the William Sonoma website, was something I had pinned a few weeks back in anticipation of making "someday." What appealed to me most about this recipe was that it's an easy one pot meal, perfect for a weeknight dinner. Season the chicken lightly with salt and pepper and then generously with paprika. In a heavy large frying pan over medium-high heat, warm the oil. Add the chicken and cook until brown, about 2 minutes on each side. Transfer the chicken to a plate. Add the potato quarters and carrots. Sprinkle with salt and pepper and saute until the vegetables are beginning to brown, about 5 minutes. Add the flour mix and stir to coat. Gradually mix in the broth and vermouth. Bring to a boil, stirring frequently. Return the chicken to the pan and bring to a boil. Cover the pan, reduce the heat to medium-low, and simmer until the chicken and vegetables are cooked through, stirring and turning the chicken over occasionally, about 25 minutes. Mix in the thyme. Taste and adjust the seasoning. Divide the chicken and vegetables among 4 warmed plates and serve right away. Ultimate comfort food! I love recipes like this, they are perfect for weeknights too. Love it! Oh I love this recipe! Chicken thighs, in my opinion, are made for braising! Perfection in a pan! I, too, love Pinterest for saving ideas for great weekday meal ideas. This is exactly the type of one-pot meal that I know my family would love! Wow that just looks super comforting and divine! I love the William Sonoma website! Great for a cold winter day (or night) meal! I could eat an entire bowl of this right now! Wow these look so good! Healthy and easy! I really wish this was my dinner tonight! I need to make it soon! This is perfect comfort food in my book - I'm seriously thinking about making it tonight for dinner because we have all of the ingredients! I'm a Pinaholic too! I'lm putting this one my to do board! So comforting! I'm all about quick and easy meals so this is perfect for me! Ooh, I love William Sonoma recipes too, this sounds wonderful! Plus I love thyme with chicken, pinning to make someday myself! Pinterest has so many useful ideas. Your recipe is so good. It looks very inviting. Such a hearty delicious meal! I'll be trying this recipe! This looks so nice and warm and filling. I know winter is slipping away but we need a few more dinners like this first! This has all the flavors I love, thyme is a favorite herb and this just have comfort written all over it. Whoa this looks so comforting!